If you are reading this in the year 2019, the words Opioid crisis will be familiar to you, especially if you are based in the US. Opioids is the term given to a group of compounds obtained from the poppy plant. These are also termed as narcotic substances. Many of which as medical use as analgesics for a variety of conditions from something as simple as the pain due to a broken bone to heart attack and cancer. Morphine is the more commonly used opioid in most countries, but there are non-medical and illegal derivatives that may be more addictive, potent and thus far more toxic than morphine. It is due to this reason that the abuse and misuse of these substances have led to the opioid crisis in the USA. These drugs may be consumed in a variety of forms, by injection, orally or inhalation of powder. Though injection may be more common. Often due to tolerance, most subjects will increase the dose of the drug, or they may already be under the effect of the same or other substances and accidentally take a high dose leading to overdose. Toxidrome: The most recognisable toxidrome of these drugs is CNS depression, respiratory depression and the famous pinpoint pupils. Treatment: Luckily these drugs have an antidote in the form of Nalaxone often available in the US in the form of an autoinjector type of pen, similar to an EpiPen. Effects should be seen immediately but unfortunately, last only for 10 min and must be given in the form of continuous infusion until the opioids clear the body. Since most commonly the patients are addicts, they are likely to experience such poisoning again and must be provided counselling. Naloxone works by competing with the opiate at the receptors and thus blocking its signals. 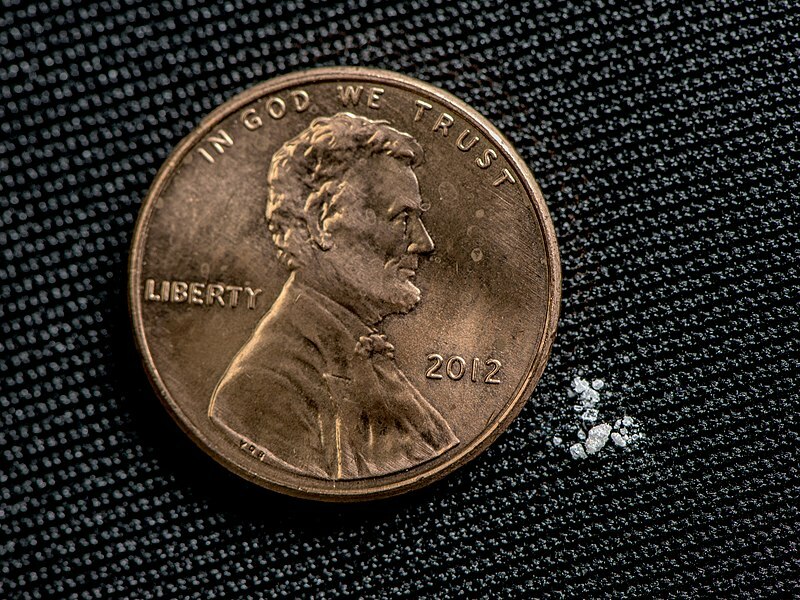 The above image shows 2mg of fentanyl next to a cent coin. The mere amount of 2 mg of this newer synthetic opioid is the lethal dose of this drug. It is more potent than morphine (500 times).